Purely an Indian product contributed towards dental hygiene. It is scientifically designed using sterlized nylon bristles with rounded tips. It has soft, durable texture and correct shape to clean and polish each and every corner to your dental system . Available in different eye catching colours with hard, medium, soft and super soft textures and size suitable for Baby, Junior and Adults . - Easy-to-hold handle designed for baby's hand and enhances dexterity. - Baby-soft bristles gently cleans and messages baby teeth and gums. Price Range: Rs 7 - 9 /Piece. 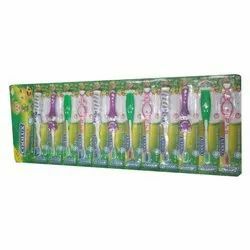 Ampar Fast Moving Products Manufacturing Co.
Our association is broadly known for maintaining the quality in offering Baby Plastic Toothbrush.